left Roy Lichtenstein working on the collage that would serve as the basis for the Times Square subway mural. Metropolitan Transportation Authority's Arts for Transit program commissioned Roy Lichtenstein to create a mural for the Times Square subway station. A native New Yorker who had ridden the subway since boyhood, Lichtenstein jumped at the chance to create a work of public art. So he designed a 6-foot-tall, 53-foot-long porcelain enamel futuristic vision of New York, which he decided to make a gift to the city. Lichtenstein fabricated the mural in 1994, three years before his death. 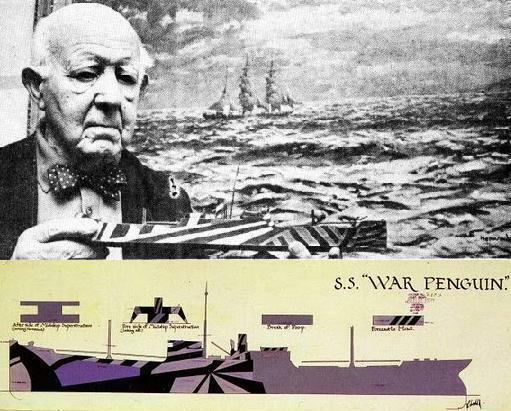 right During World War I, the British and Americans faced a serious threat from German U-boats, which were sinking allied shipping at a dangerous rate. All attempts to camouflage ships at sea had failed, as the appearance of the sea and sky are always changing. Any color scheme that was concealing in one situation was conspicuous in others. 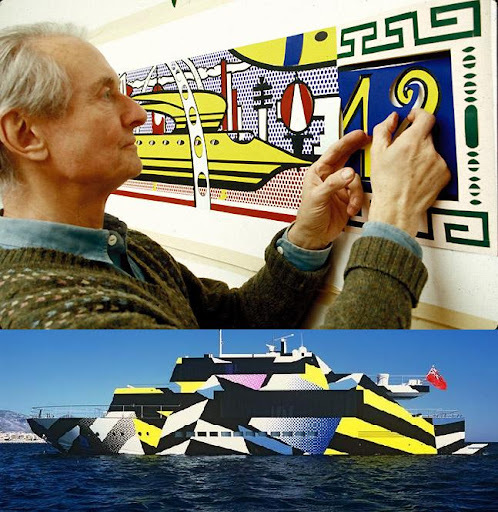 A British artist and naval officer, Norman Wilkinson, promoted a new camouflage scheme that was derived from the artistic fashions of the time, particularly cubism. Instead of trying to conceal the ship, it simply broke up its lines and made it more difficult for the U-boat captain to determine the ship's course. The British called this camouflage scheme "Dazzle Painting." The Americans called it "Razzle Dazzle."